Did you know that refrigeration copper coils are soft enough to bend with your hands (i.e. without having to use a torch to anneal it)? I certainly hadn't tried so I didn't know. This coiled copper wind chimes tutorial is by Handan and Greg of The Navage Patch. It's basically a double spiral technique which is often used in jewelry making to encase beads. I love that colorful beaded chain part! 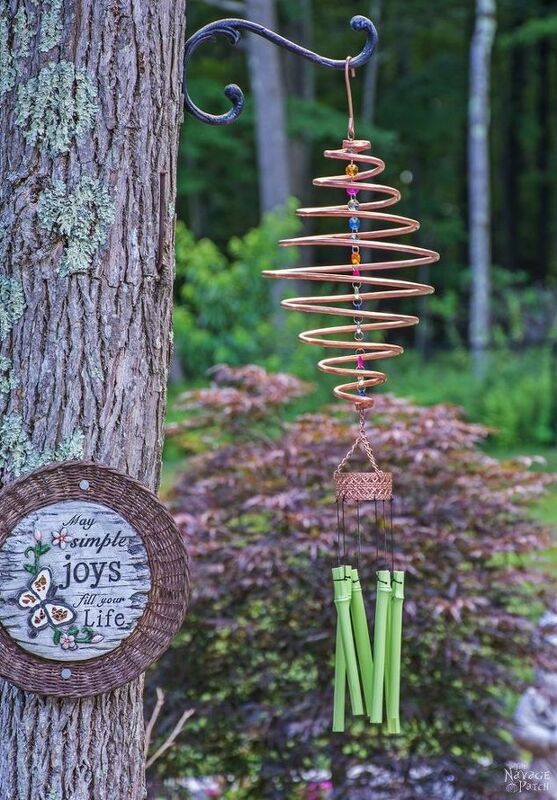 The second part of the wind chimes tutorial shows how dollar store wind chimes were taken apart and integrated into the design. If you want to make the design more elegant, then use the anodinized aluminum chimes. such as these ones (they come in different colors). Now this is something I'd make for a wind chime. I buy my rolls of copper tubing from either the hardware store or from Princess Auto. Since you can buy it in different sizes why not buy a length in a larger diameter and make your own chimes. You could even torch them for some colour...or etch a design into them.